Staffordshire Bacon Sandwich | Packington Free Range | Born and reared outdoors. Always. A great take on the nation’s favourite sandwich with a twist. 1. Fry your bacon in a little olive oil. 2. While the bacon is cooling, brush slices of the bread with olive oil and cook under the grill or in a griddle pan over a high heat until toasted. 3. Mash the avocado and squeeze over a little lemon juice. 4. Cut the beefsteak tomatoes into thick slices. 5. 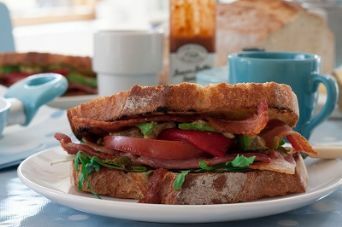 Assemble the sandwich – bottom slice of toast, drizzle of Bacon Butty Sauce, a handful of salad leaves, a few rashers of bacon, slices of tomato, 1-2 roasted pimento peppers, finished off with some of the mashed avocado and the second layer of toast. 1. Go easy on the Bacon Butty sauce – too much will make the sandwich soggy. 2. When frying your bacon, the key is ‘’low and slow’’. This will ensure it is thoroughly cooked through and shouldn’t leave the rashers too crispy. 3. If you’re using whole pimento peppers from the jar, they can be very oily. Drain them off a little before piling onto your salad. 4. Avocados can take a long time to ripen so be sure to buy them a day or two in advance, or choose the ‘’ready to eat’’ avocados from supermarkets. 5. Drizzle a little lemon juice onto the avocados before mashing to stop them from going brown.